How can manufacturers bridge the knowledge gap between design and procurement? 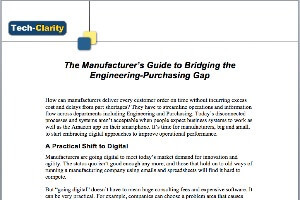 The Manufacturer’s Guide to Bridging the Engineering-Purchasing Gap shares our perspective on how manufacturers can take a digital approach to sharing critical BOM data from Engineering with Purchasing so they can reduce cost, improve efficiency, and prevent late shipments due to part shortages. Please enjoy the article below, or click the title to download the full PDF (no charge, no registration required). For more information on closing the Engineering-Purchasing gap, please visit our sponsor OpenBOM. How can manufacturers deliver every customer order on time without incurring excess cost and delays from part shortages? They have to streamline operations and information flow across departments including Engineering and Purchasing. Today’s disconnected processes and systems aren’t acceptable when people expect business systems to work as well as the Amazon app on their smartphone. It’s time for manufacturers, big and small, to start embracing digital approaches to improve operational performance. Manufacturers are going digital to meet today’s market demand for innovation and agility. The status quo isn‘t good enough any more, and those that hold on to old ways of running a manufacturing company using emails and spreadsheets will find it hard to compete. But “going digital” doesn’t have to mean huge consulting fees and expensive software. It can be very practical. For example, companies can choose a problem area that causes them trouble, such as collaborating between Engineering and Purchasing to build prototypes or small production runs, and take a digital approach to improving it. 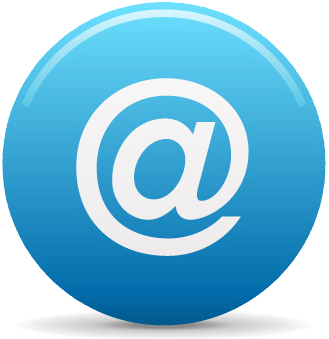 Let’s look at closing the communications and information gap between design and procurement. Engineering and Purchasing need to be on the same page to meet customer ship dates or risk losing revenue and customer satisfaction. A simple thing like sharing part requirements gets challenging with different configurations, changing designs, and dynamic supply chains. 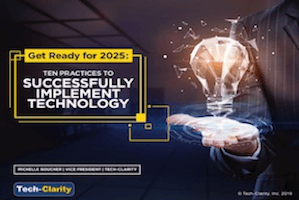 Experience shows that this complexity leads to errors in the world of office documents, shared drives, emails, and other ad hoc tools that lead to using outdated and incorrect information. 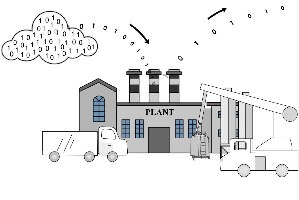 Manufacturers need to close the information gap by providing centralized, shared information in a digital format. 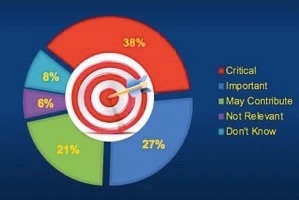 Information buried in a spreadsheet or a CAD file isn’t much more effective than hand-written notes on a whiteboard. Some people have visibility to the information, and hope that it’s accurate, but others are left guessing. The core of this communication is parts, organized in BOMs, to let people know what, when, and how much they need to buy and make. Beyond this, companies need to gather purchasing information that’s typically spread out in multiple catalogs or websites to make a buying decision. The process is challenging in any organization, whether the responsibility is on one person, one department, multiple departments, or spread out across a global supply chain that includes contract manufacturers. More importantly, it leads to late orders and excess cost. A digital, cloud-based approach can help streamline the process, improve speed, and reduce errors. Let’s look at it from three different perspectives – the Engineering, Purchasing, and Operations views. What does Engineering need from the design – procurement workflow? They want to make sure that everyone downstream has the data they need to make their products right. But they don’t want to have to reenter a lot of information in a complex tool to do it. And if it’s cumbersome, they’ll wait until the information is finalized so nobody sees it until the last minute. They want to export their BOMs from their CAD tool, add data like materials or other specs, pull in standard part data where they can, have it all easily accessible to the right people, and have everything stay in sync when they make changes. 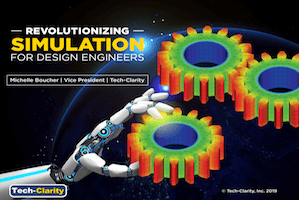 They would also love to be able to access a cohesive design history covering all revisions and changes, a complete digital thread of the product development process. The bottom line is that they want to make sure whoever is buying parts, even if it’s a contract manufacturer on the other side of the planet, has accurate part requirements data so they can get it right and fulfill their design intent. What does the Procurement Specialist need from the design – procurement workflow? Clearly they need visibility to the parts they need to order in an accurate, timely parts list. They need to know what’s needed, when, and with what specifications as soon as possible, even if it’s not final, so they have time to plan. They also want to hear about changes immediately, before it’s too late and they have to expedite and/or return parts. Purchasing also wants accurate part information for themselves and others to make the right decisions, to have everyone use the same part numbers so they can manage inventory and where-used, and optimize part buys. They want to optimize their procurement strategy by guiding Engineers to make the right part selections. But they want this without having to use a complex tool or enter information manually that could be imported from suppliers, websites, or catalogs. The bottom line is they want accurate data so they can make sure Manufacturing has the parts they need on-hand, without overpaying or carrying too much inventory. Operations just wants everything to run smoothly. They want everybody to be on the same page so nobody makes mistakes and buys or builds the wrong thing. They want this so that customers aren’t upset about missed ship dates and they don’t suffer from excess cost from poor contracts, rush shipping, or excess inventory. They want to avoid lost productivity and expediting missing or lost parts. They also need to manage spend, so they want to make sure they’re getting the best pricing from multiple suppliers, catalogs, and/or websites. The bottom line is that they want to reduce risk and protect revenue by keeping everyone coordinated to get the product out of the door. They can’t afford ad-hoc tools that don’t work for everyone, but also don’t have time to train engineers and purchasing people to be power users for complicated software. And they probably don’t have the appetite to install new hardware and software, and would prefer simple tools that work but don’t suffer from the shortcomings of office productivity tools. The common thread across of these roles is the desire for accurate data and simplicity. Companies can’t afford disconnects in today’s agile, digital-speed world. They have to avoid the errors and inefficiencies of general tools like spreadsheets and generic cloud file storage, leverage common data to avoid mistakes in the supply chain, and develop the ability to easily gather information to make the right buying decisions. 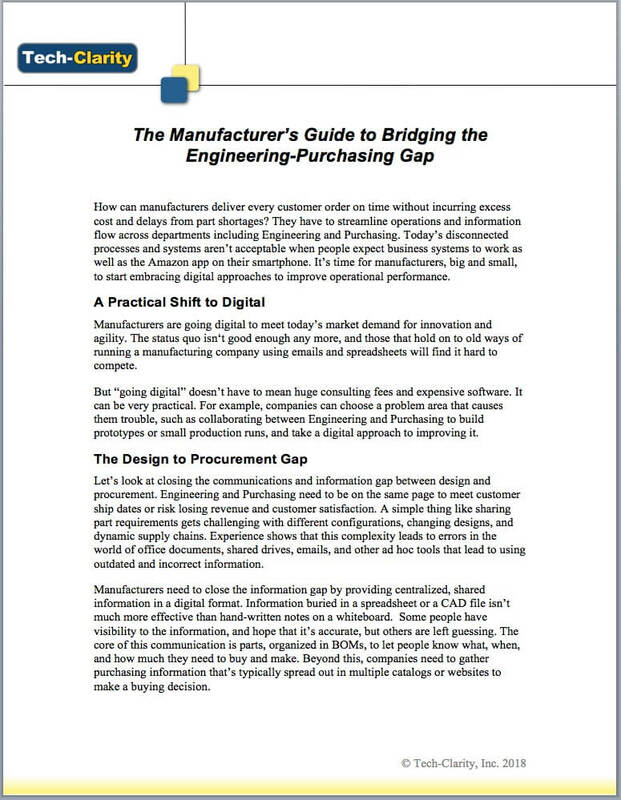 It’s time for manufacturers to analyze their basic requirements to close the design to procurement gap, find a solution that fits their needs, and do so in a way that’s consistent with their willingness to take on the learning curve, cost, and complexity of enterprise solutions. It’s a good idea to start small and grow, but stay away from dead-end office automation tools or generic file sharing solutions that don’t address their collaboration needs. 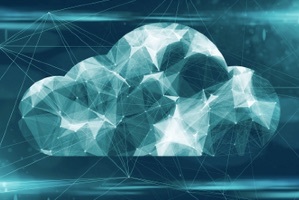 Companies of all sizes should consider easy to adopt, easy use, cloud-based solutions to streamline processes and close information their information gaps.